Red Rock Canyon and this was growing right out of solid rock. Tremendous!!! Were there any cave dwellers? I used to have a book and the cave homes looked similar to the pictures in it. And that wonderful, precious, brave tree. Life on such a rocky place. That beautiful green!!! A wonderful picture. Beyond description! very pleasing image, and unique also. Love the colours in the rock. 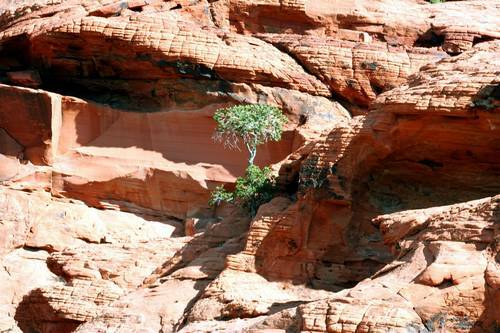 hard to imagine how a tree could exist there.